If you are in the market for a new flat screen television that has some of the amazing newest features for 2017, you should consider this model from Samsung. Priced somewhere around $1000, it is well-worth the money as it delivers amazing 4K resolution, great smart features, and a lot more. 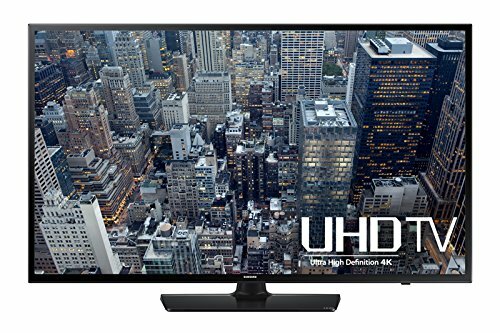 This 4K UHD TV is one of the best TVs currently offered by this brand. It offers the same quality sound and picture that Samsung TVs are well-known for, with some new features which make the Samsung UN55JU6400 a must-have for any television enthusiast. This TV has a lot to offer to all types of TV viewers. It is the perfect upgrade for consumers who are quite new in the world of Smart TVs and 4K UHD resolutions. The TV ensures a crystal-clear image with this amazing resolution making it ideal for those who love to watch live events or HD movies. Nevertheless, we must mention that, even though you can expect to get many new, high-quality features with this 55-inch higher-end TV model, you should know that some of the most recent upgrades and features currently available on newer TV models from Samsung are not offered on this TV. But, for the avid consumer who just wants a great upgrade, this model is an amazing choice. Here’s why. When it comes to picture performance, contrast is the strongest point of this model. In order to produce deep black level and strong contrast, the TV is powered by UHD Dimming technology. Those who are more familiar with these new technologies and features will probably know that this is an enhanced local dimming technology developed by Samsung for enhancing the black level and contrast of the picture produced by their 4K UHDTV lineup. This strong contrast on the 4K screen of this TV is additionally enhanced by Contrast Enhancer technology. When it comes to color performance, whilst this model is supported by PurColor technology, it doesn’t have Wide Enhancer Color Plus technology which is created for widening the color spectrum. The lack of this technology on the Samsung UN55JU6400 naturally reduces its color performance. But still, the picture shown on 4K screen of this TV looks natural and clear. Also, the 4K UHD upscaling engine on this model is great. You can enjoy any type of video source, especially 1080p video content, in amazing 4K quality. The Smart TV platform for this TV is powered by the amazing Tizen operating system, and this new 2017 update provides owners of this TV with a full overhaul from the former Samsung Smart TV interface. The Full Samsung App store is now included, and it offers access to some of today’s hottest apps like Netflix, Facebook, and Amazon Prime. It is also much easier to access and use the menu as well as browsing options on the Samsung UN55JU6400 than on its predecessors. Being powered by an amazing quad core processor, the Smart TV platform on this model is really fast and responsive. Whilst this TV is an exceptional choice for anyone who wants to get a television with more futuristic features and better resolution, it doesn’t include some of the newest, latest features offered by this brand. Some innovative additions like new curved screen design, or the Smart Control remote are not offered with the Samsung UN55JU6400, so that is something to consider as well.